Can’t Remove ActionClassicGames? This page includes detailed ActionClassicGames Removal instructions! The ActionClassicGames toolbar is not an app you should tolerate. This utility is developed by Mindspark Interactive Network, Inc.; a company notorious for affiliations with ad-supported platforms. Just like the most (if not all) of the company’s products, the ActionClassicGames toolbar falls under the PUP (Potentially Unwanted Program) category. This app uses stealth installation and floods its users/victims with unwanted online advertisements. If the toolbar has managed to sneak into your device uninvited, consider its immediate removal. This PUP is an aggressive ad-generating parasite. It alerts your browser’s settings and locks the changes. The PUP replaces both your homepage and default search engine. No matter how diligently you try, you cannot undo the changes. This parasite forces numerous reshuffles on you. Your browser seems different. So is your browsing experience. You cannot touch your browser without pop-ups appearing. Every website you visit is heavy on in-text and banner ads. That’s right; it’s the PUP. It floods your browser with adverts. This parasite gets paid when you click on its ads. The more you see, the bigger the chance you click. Thus, the parasite drowns its victims in a sea of coupons and discounts. This aggressive PUP knows no boundaries. It even dares pause your online videos for commercial breaks. If you, however, refuse to click, it would start browser redirection. The toolbar loads third-party websites in new tabs and windows. Do you feel comfortable knowing that any web page out there may pop up on your screen? Do not put up with this torture! Remove the ActionClassicGames toolbar. The sooner this PUP is gone, the better! How did I get infected with ActionClassicGames? The ActionClassicGames toolbar has an official website and download. It is also available for download from third-party platforms. The parasite, however, doesn’t rely on these strategies. It tends to travel the web hidden in torrents, bundles, and corrupted links. The PUP uses trickery to sneak in behind your back. The thing is that the parasite needs your approval to get installed. It cannot get on your system uninvited. As you can imagine, though, there is a catch. This trickster lurks in the shadows and waits for you to let your guard down. It preys on your naivety. The toolbar gets installed when you don’t pay attention to the fine print. Do not make its job easier. Always take the time to do your due diligence. Download software from reliable sources only. When available, use the advanced/custom setup option. Deselect all suspicious “bonus” programs that are about to get installed. And, of course, read the terms and conditions before you agree to them. Do not let parasites like the ActionClassicGames PUP trick you ever again! Bear in mind that even a little extra vigilance goes a long, long way! The ActionClassicGames toolbar has no place on your computer. This parasite opens your web browser to surveillance and targeted ads. It jeopardizes both your privacy and security. Confused? Well, as you already know, the PUP gets paid when you click on its content. The thing is, you wouldn’t click on random adverts. The PUP has a solution to this problem. It studies your browsing habits and bases its ads on the gathered data. It looks great on paper, yet, in reality, the parasite monitors your every online activity and reports to unidentified individuals. The parasite sends every bit of information to a remote server. Anyone willing to pay can access it there. Numerous crooks do. They use it to create customized adverts. They would then push the ads to your browser through the PUP. The crooks show you what you want to see, but when you click, bad things happen. 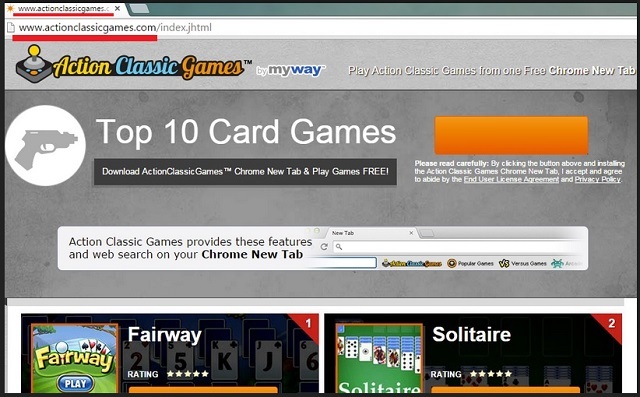 The ActionClassicGames toolbar threatens to redirect you to dangerous websites. This parasite turns you into an easy target. Do not put up with such malicious interference. Spare yourself many future headaches; remove the PUP before it lures you into an online trap! How Can I Remove ActionClassicGames? If you perform exactly the steps below you should be able to remove the ActionClassicGames infection. Please, follow the procedures in the exact order. Please, consider to print this guide or have another computer at your disposal. You will NOT need any USB sticks or CDs. Locate the ActionClassicGames program and click on uninstall/change. To facilitate the search you can sort the programs by date. Review the most recent installed programs first. In general you should remove all unknown programs. Navigate to C:/Program Files and delete ActionClassicGames folder. Double check with any antimalware program for any leftovers. Keep your software up-to date! ActionClassicGames may have the ability to replicate itself, if not completely cleaned. This may require tracking down hundreds of files and registry keys. You can choose to use Spyhunter Professional Anti-Malware Program to deal with any infection that might be lurking along with ActionClassicGames!